I love this period picture from 1988 because of its timelessness. 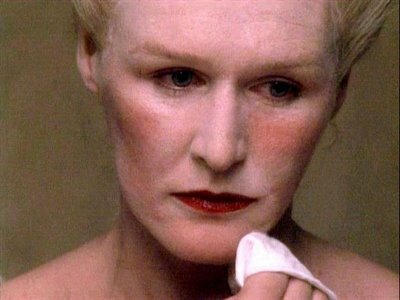 Set in pre-Revolution Paris, Glenn Close is at the top of her game playing the Marquise de Merteuil, who plots revenge against her ex-lover, the Comte de Gercourt, who has ended their relationship. 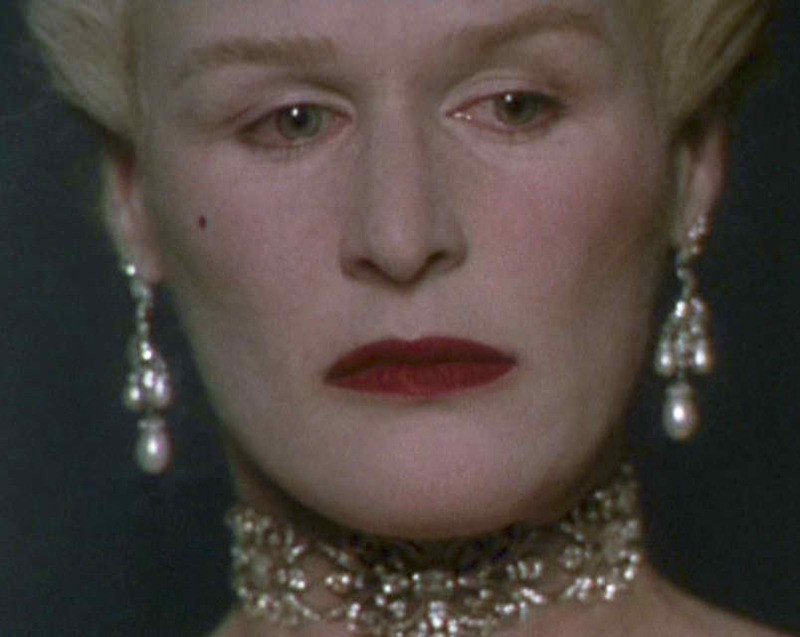 Close’s character is gleefully amoral (her favorite word is “cruelty”) and amuses herself by manipulating men out of boredom, and resentment over the subservient status of women in 16th-century French aristocratic society. You couldn’t ask for a better role, written by Christopher Hampton, adapted for the screen by his play based on the novel by Pierre-Amboise-Francois Choderlos De LacLos. Hampton won an Oscar for Best Adapted Screenplay in 1988 and his script is a marvel to read as much as the final film is to watch. 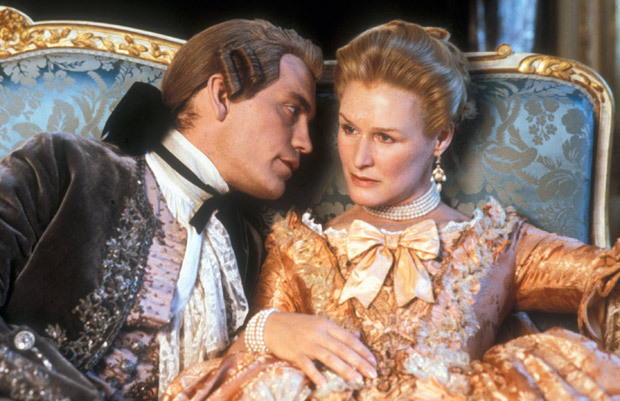 To soothe her wounded pride and embarrass Gercourt, Merteuil seeks to arrange the seduction and disgrace of his young and virtuous fiancée, Cécile de Volanges (played by a very young and beautiful Uma Thurman), who has spent her formative years in the shelter of a convent. 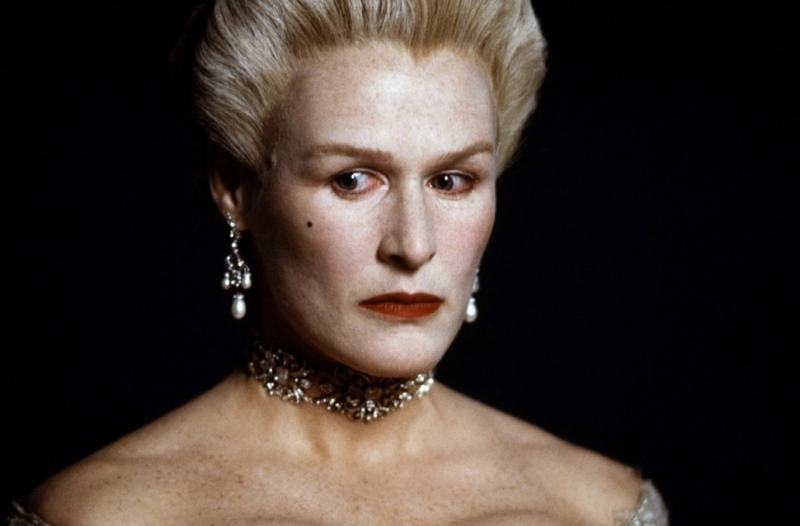 Merteuil calls on the rakish and completely unprincipled Vicomte de Valmont (John Malkovich) to do the deed, offering him her own sexual favors as the reward for a successful conquest. 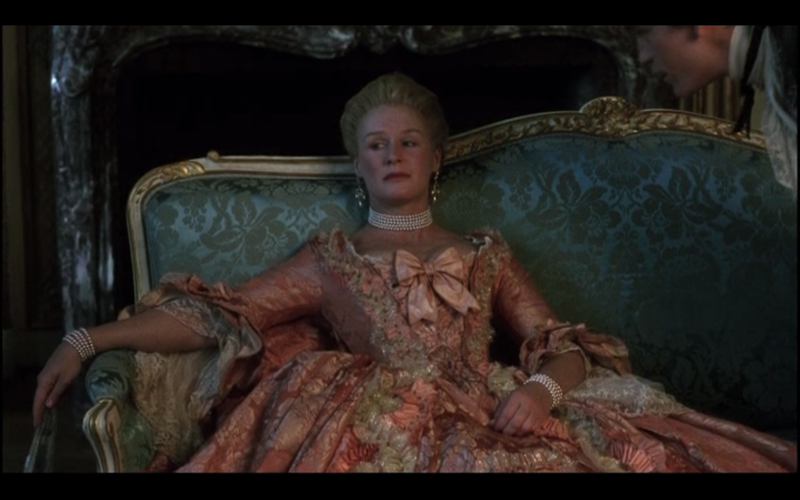 But Valmont declines, as he has a seduction of his own in progress: Madame de Tourvel (the lovely Michelle Pfeiffer), the virtuous wife of a member of Parliament. 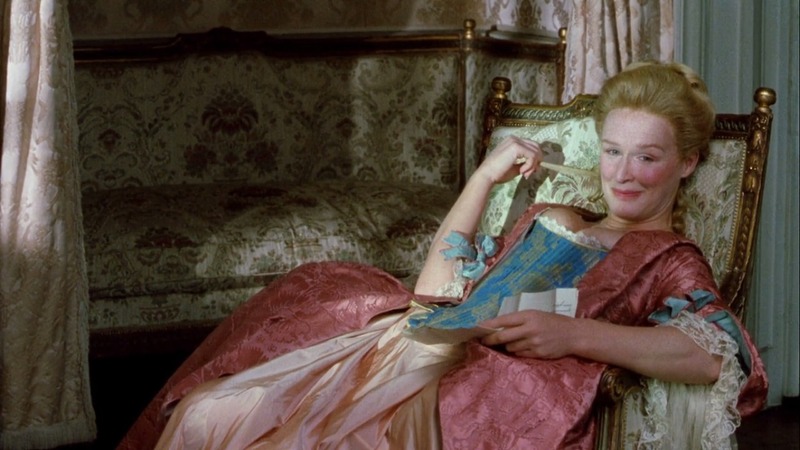 But not one to refuse a challenge, Valmont modifies the proposal: If he succeeds in sleeping with Tourvel, Merteuil must sleep with him as well. Merteuil accepts, on the condition that he furnish written proof of the liaison. For anyone who has ever been in love, Dangerous Liaisons has something for you: Love, Passion, Betrayal, Bitterness and Revenge. We may not have acted on the last one but who hasn’t thought of it am I right? And that’s what this movie centered around, the grandest of guilty human pleasures, revenge on someone who has broken your heart. The fact that the revenge plot ends up turning on the conspirators in the end is what makes this drama so ingenious and relays the message that even the cruelest of people can still be touched by love, hurt by the loss of it and redeemed by it in the end. 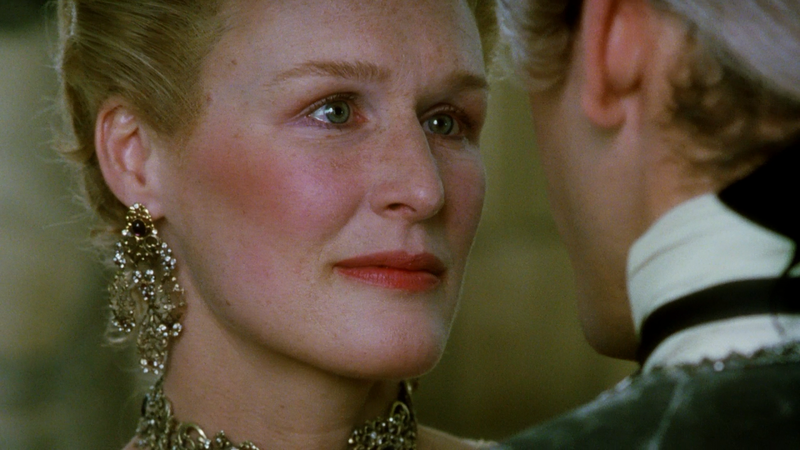 Glenn Close is a revelation in her role as the scheming mastermind Merteuil. She is as evil, vindictive and formidable as any movie villain and would make Close a much-sought after actress in the late ‘80s and early ‘90s. Equally effecting on the other side of the pendulum is Michelle Pfeiffer as Madame de Tourvel, the very embodiment of virtue who will be destroyed body and soul by Valmont (John Malkovich eating the scenery in a powdered-wig). An interesting side note: Michelle Pfeiffer appeared in Tequila Sunrise and Married to the Mob in addition to Dangerous Liaisons in 1988. That’s range, baby! What I love as a writer is when you open a script (Hampton’s screenplay is available for free download online if you do a simple search) and there is one line of dialogue that sums up the entire emotional core of the motion picture. For Dangerous Liaisons, this line occurs on page 10. Merteuil (Close) is speaking with Valmont (Malkovich) as they concoct their evil plot when the discussion comes around to love. Love is something you use, not something you fall into, Like quicksand, don’t you remember? It’s like medicine, you use it as a lubricant to nature. Of course, Close’s character is setting herself up along with everyone else for a fall. As cynical and coldly calculating as she thinks she is, she will end up hurting herself as much as anyone and destroying the thin-veneer of respectability under which she conducts her machinations. 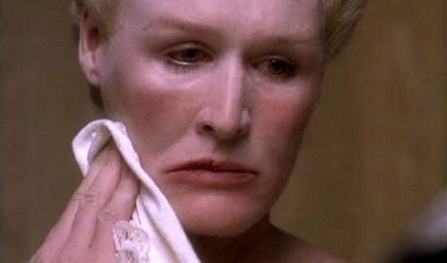 And that is how Dangerous Liaisons acquires the rarest of qualities in a movie, let alone a movie role. For this movie may be set in Pre-Revolutionary Paris, France but the historical context is secondary. Rather, it is a timeless story about lust and disgust, love and betrayal, good and evil. It is about people stripped down to the bone, exposed as their fortune’s rise and fall, played out for all to see. And in that way, the underlying storyline could not be more contemporary, the setting anywhere and virtually any time in human history. 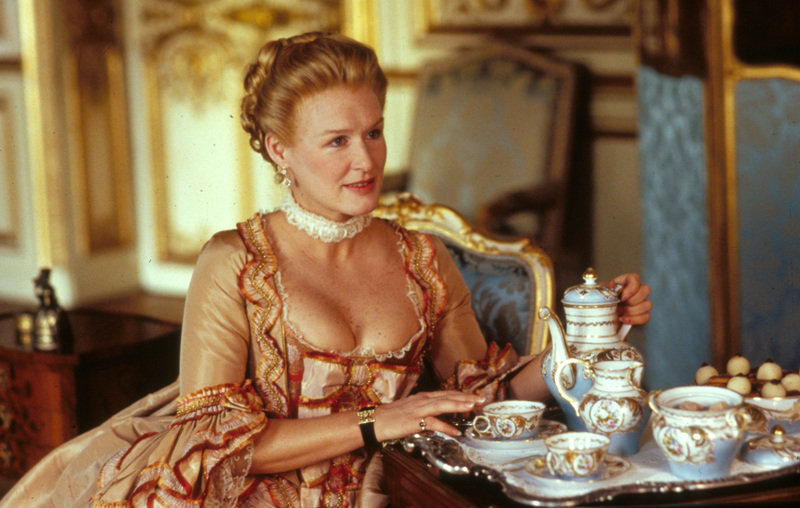 At the end of Dangerous Liaisons, most of the characters have been consumed by either love or hate. 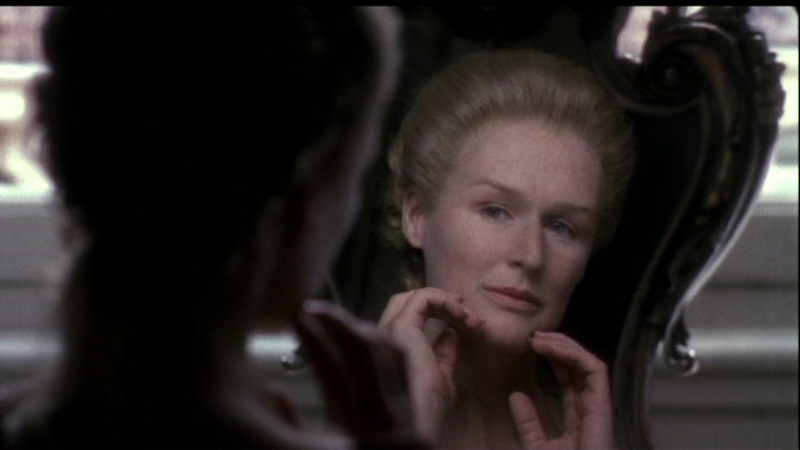 Close’s Merteuil will end up being stripped (literally of clothes and even makeup in the final shot) of her social standing, her lovers, and her power. Her fate is sealed as much as that of France’s aristocracy on the eve of revolution. The ending of this movie is so powerful that it gives you (or at least, me) shivers. 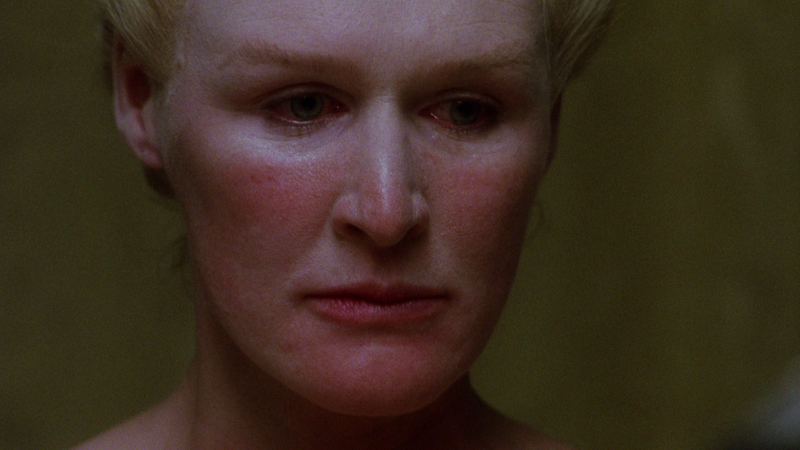 The intimacy created with this despicable character by the extreme close-ups evokes sympathy for the devil herself. Close holds the audience’s attention, staring out at them with contempt, fear, loss and despair. She may be staring into a mirror on screen but she is breaking the fourth wall to connect with us, warn us that if we’re not careful we will be next. Caution us that if used as a weapon, Love can destroy. I encourage anyone who wants to delve deeper into this complex movie to download the script, rent the movie and see how Christopher Hampton’s script, Stephen Frears direction; Close, Malkovich and Pfeiffer’s acting (and Peter Owen and Jean-Luc Russier’s Hair and Makeup) created a masterpiece of the human condition. A film that would be remade in 1999’s Cruel Intentions and is as timeless a tale as Shakespear’s Taming of the Shrew or Hamlet. And for a period piece, Dangerous Liaison’s sets are unequalled in the opulence of France’s gilded age, the perfect background to a moment in history when the divide between the haves and have-nots could not have been wider. Not unlike the United States of America, circa 2014. You’re right, Cindy. Glenn should have gotten the Oscar! Great analysis of the book/play/film script. Though I have to say that I saw this in the West End with the original cast of Lindsay Duncan and Alan Rickman as Merteuil and Valmont, and by contrast found Close and Malkovich were rather too panto villain for me, and lacked a certain seductive subtlety. What was particularly disturbing about Duncan and Rickman is that somehow they made the audience want THEM to triumph, and that made for quite uncomfortable watching, and made the audience complicit, rather than able to stand outside and comfortably judge.